Scientists used a molecular clock to determine all 8 species of black bass share a common ancestor that lived 11 million years ago. The molecular clock is a method scientists have of estimating the age of a species. It’s especially helpful when studying the evolutionary history of organisms that are absent or rare in the fossil record. It is based on the assumption that DNA protein sequences evolve at a relatively constant rate. Scientists assume a substitution rate of appearance of new mutations in each member of the population. Scientists eventually learned the substitution rate varies among different kinds of organisms, so they calibrate the molecular clock with the fossil record and known geological events that may have caused species divergence. This involves a lot of computer modeling and statistics, but they are confident that using a molecular clock is a reliable method of estimating evolutionary ages. The oldest bass fossil ever found was unearthed in Texas and dated to 23 million BP. Scientists estimate the Micropterus (black bass) genus originated about 26 million years ago, based on molecular clock data. This suggests their findings are consistent with the fossil record. Today, there are 8 species of bass that began to diverge from a common ancestor 11 million years ago when a marine transgression flooded most of the coastal plain in the southeast. This dramatic rise in sea level isolated many populations of bass, resulting in allopatric speciation. Scientists believe this is the most common type of speciation, and it occurs when founding populations become geographically isolated. Range map of 8 species of black bass. The dots represent collecting localities for specimens used in study. From “Speciation in Micropterus” referenced below. Click to enlarge. Time calibrated phylogram showing evolutionary history of black bass. 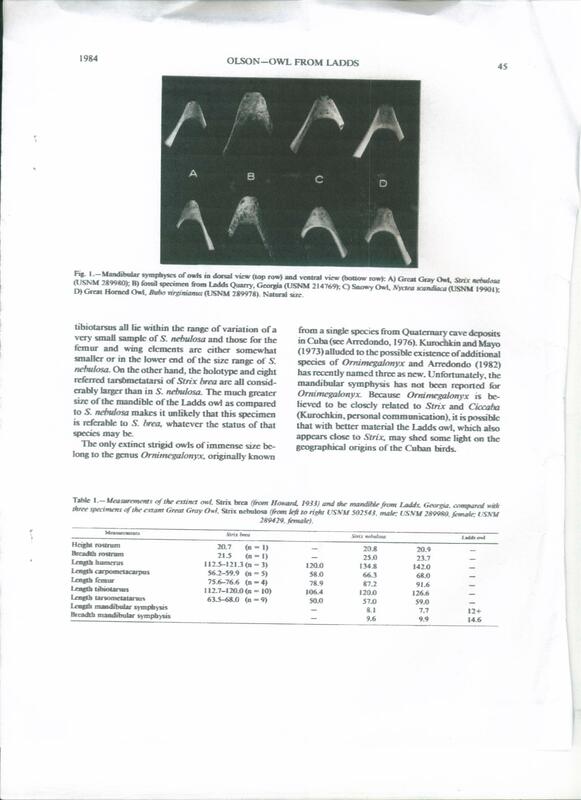 This is also from “Speciation in Micropterus.” The scientific names translated to common names are: Micropterus punctulatus–spotted bass, M. dolomieu–smallmouth bass, M. coosae–redeye bass, M. cataractae–shoal bass, M. notius–Suwannee bass, M. treculi–Guadulupe bass, M. salmoides–largemouth bass, M. floridanus–Florida largemouth bass. The common ancestor of smallmouth and spotted bass diverged from the ancestor of the other 6 species of bass during the marine transgression of 11 million BP. Later rises in sea level between 8 million BP-2.5 million BP further resulted in the evolution of redeye, shoal, Suwannee, Guadalupe, largemouth, and Florida largemouth basses. 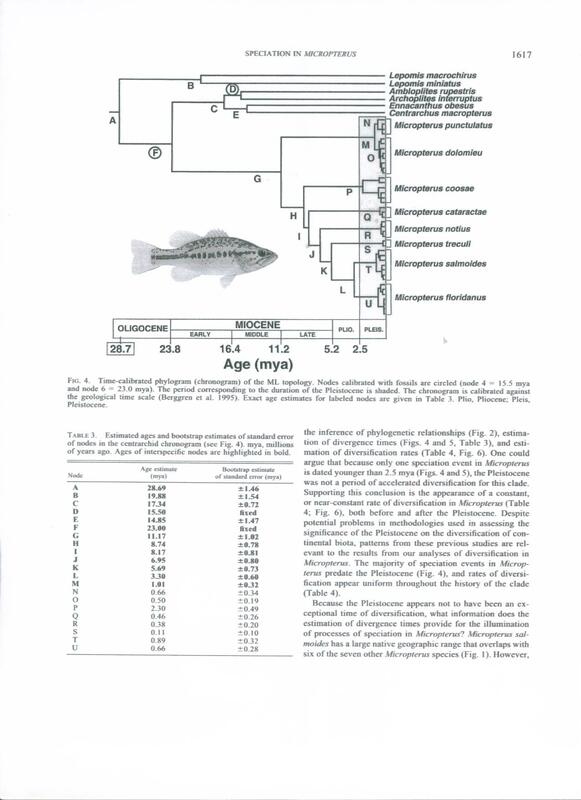 Before this study scientists thought speciation of bass occurred due to climate perturbations of the Pleistocene, but now they realize most Micropterus species evolved before Ice Ages began. Only the divergence of spotted bass and smallmouth bass occurred during the Pleistocene about 1 million years BP. These sister species may have been isolated from each other by a glacier, but the other species of bass originated in warmer climates that remained glacier-free. Most black bass species readily hybridize, showing just how closely related they are. This can prove a problem when a common species is introduced to waters occupied by a rare species. Shoal bass were formerly abundant in the rocky cataracts found in the Flint, Chattahoochee, and Appalachiacola Rivers, but most of those areas were inundated with reservoirs that make the habitat unsuitable. Shoal bass became rare, and to make matters worse spotted bass were introduced. Spotted bass compete for the same foods and hybridize with the remaining shoal bass. Comparison photos and illustrations between 4 species of bass. The bottom photo is of a a redeye bass. It has a curious distribution. It’s found in 2 different river drainages–the Coosa and the upper Savannah. At one time these 2 drainages must have been connected. The below link has some nice photos comparing the shoal bass with other species of bass. White bass (Morone chrysops), striped bass, (Morone saxatilis), and black sea bass (Centrophis stiata) are not closely related to the Micropterus genus, despite their common names. Instead, the Micropterus genus is part of the Centrarchid family that includes sunfish and crappies. Surprisingly, largemouth bass can hybridize with some of their distant sunfish and crappie relatives. Adult largemouth bass prey on smaller fish, frogs, crayfish, and occasionally birds and mice. Most of the largemouth bass’s sister species grow smaller and feed more on insects and small crayfish. Smallmouth and spotted bass feed on prey intermediate in size between that taken by the largemouth and its 6 sister species. The largemouth bass’s range overlaps with those of its sister species, but they occupy different ecological niches. The introduction of intermediate feeders, like the smallmouth or spotted, may disrupt the ecosystems in southern rivers. A few scraps of bone found at just 2 fossil sites in Georgia indicate a now extinct species of owl, larger than any present day owl species, used to live in the region. Starrs Olson compared a mandibular symphysis discovered on Ladds Mountain, Bartow County with those from a great horned owl (Bubo virginianus), a snowy owl (Nyctea scandiaca), and a great gray owl (Strix nebulosa). On a human the mandibular symphysis is the cartilage in the front dimple of the chin that connects the left jaw bone with the right jaw bone, but on a bird it’s the lower bill. The unknown species of owl’s lower bill was significantly larger than those from the extant largest species of owls. Photo comparing the mandibular symphysis of the unknown Pleistocene species with those from the 3 largest species of extant owls. It’s the largest lower bill, suggesting this extinct species was larger than any North American owl species still extant. David Steadman examined all the bird fossils excavated from Kingston Saltpeter Cave, also located in Bartow County, and he came across 2 unusually stout tarsometatarsii from juvenile owls that didn’t match the measurements from any known species of owl. The tarsometatarsi is a bird’s equivalent of an ankle bone. Tarsometatarsii from vultures and condors. I couldn’t find any photos on the web of owl tarsometatarsi. Those 2 specimens from Kingston Saltpeter Cave either belong to the same species that Starrs Olson examined, or they belong to yet another unknown extinct species. Neither paleo-ornithologist was willing to describe a new species based on such scant evidence, even though it’s fairly certain a large unique owl did exist here during the Pleistocene. This case reminds us of why the La Brea Tar Pits are of such value to science. A different extinct Pleistocene owl also used to live in the American southwest. It’s known as the Brea owl and was recently given the new scientific name Oraristrix brea. At least 23 individual Brea owls became trapped in the tarpits, leaving scientists with many specimens to examine. But if it wasn’t for the tarpits, there’s barely enough evidence to recognize this animal as a species because just a few fossil specimens of this owl have been found at 2 other sites in Arizona and Mexico. The unknown Georgia species was likely a spectacular bird that would have impressed any human who had a chance to see it. Like most large predatory birds, it probably lived in low population densities. Let’s assume an average of 1 individual lived per 10 square miles, and that an average owl’s lifespan was 3 years. Let’s also assume this bird had a limited geographical range of about 60,000 square miles ( the area of present day Georgia). And suppose this animal existed as a species for 1 million years. I did the math: 1.8 billion individuals of this undescribed species of owl lived on earth, and the only evidence we can find is a lower bill and a couple ankles. Moreover, there’s no evidence at all of its immediate evolutionary ancestor. My calculations show just how low the odds of an organism becoming a fossil can be, especially for a forest bird that successfully can avoid dying in a flood when the possibility of being covered by sediment and preserved is higher. No Pleistocene fossils of ivory-billed woodpeckers or Carolina parakeets have ever been found either, though parakeet fossils from the Pliocene have been unearthed in Nebraska. Scientists are interested in finding more fossils of this owl. Besides earning the honor of naming a new species, they want to unravel the possible evolutionary relationship between this large owl, and the extinct giant Cuban owl (Ornimegalonyx), a flightless owl that served as top predator there until its extinction when man disrupted the environment. The unknown Georgia owl was probably not flightless because it would have faced too much competition from large mammalian predators. Its shorter, stouter legs suggest it was also not likely a ground dweller, like the Brea owl of the southwest. Nevertheless, it undoubtedly was at least a fearsome predator as the 3 large owls below. Great horned owl with captured skunk. The great horned owl is the heaviest extant species. They’ve been known to prey on tom cats and they regularly prey on skunks, squirrels, rabbits, turkeys, and grouse. The lower bill of the unknown extinct species was 25% larger than that of this species, the great gray owl. If the overall body proportions were the same, than the extinct Pleistocene owl of Georgia was probably about 25% larger than this species as well. Snowy owls have been known to attack small house dogs. The extinct Pleistocene species that used to live in Georgia was also likely a fearsome predator of small mammals. What caused the extinction of this mystery owl? I believe a large fearless owl living in low population densities was easily overhunted by men. 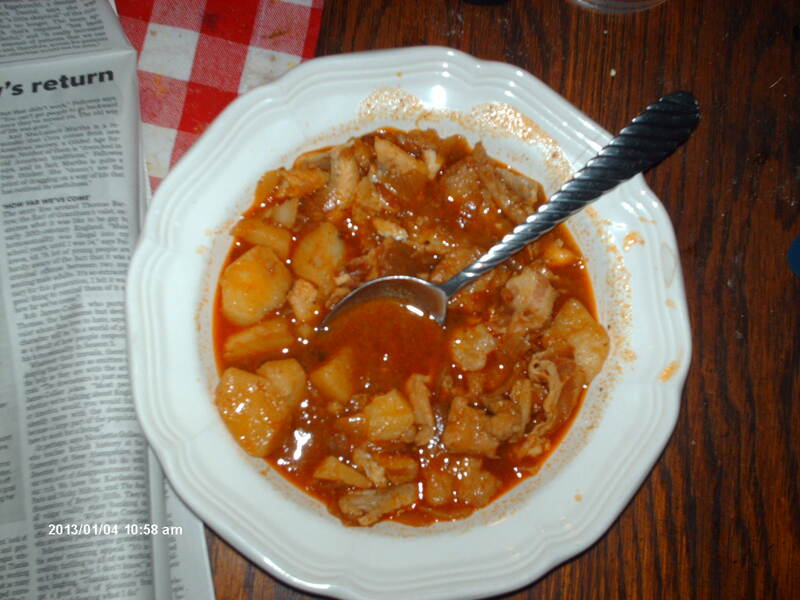 According to George Leonard Herter, owl meat is as white and flavorful as chicken. They reportedly have large drumsticks. There’s also the possibility that this owl scavenged meat for part of its diet, and the extinction of the megafauna reduced its food supply. Or this owl may have had a narrow ecological niche that disappeared at the end of the Pleistocene. Whatever the reason for its extinction, it’s a shame that we know so little about this animal. The Scolopacidae family includes birds that are commonly considered denizens of the sea shore, such as sandpipers and curlews, but 3 species are primarily terrestrial inhabitants. The upland sandpiper (Bartramia longicauda), also known as the golden plover or Bartram’s plover, is the one most easily recognizable as a relative of its familiar sea shore cousins. However, it preferes grassy environments where it feeds upon insects and grass seeds instead of marine worms, clams, and fiddler crabs. Upland sandpipers were formerly an abundant bird of the prairies on the Great Plains and in the midwest, but market hunting destroyed the primeval population, and farmers replaced prairie grasses with fields of wheat and corn that are unsuitable habitats for this bird. In March 1821 just 1 market hunter killed 48,000 upland sandpipers, demonstrating how abundant they used to be. (They were regarded as a delicacy by Creole cooks.) This bird will never regain its former abundance, but the remaining population is adapting to new anthropogenic grasslands–abandoned strip mines and airports. Upland sandpiper. They are a ground nesting bird that feigns injury to draw predators away from their eggs and nestlings. The upland sandpiper is a summer migrant to North America, and it winters on the Pampas of South America. Aside from an occasional vagrant, this bird is presently absent from the southeast, but it was a common species in this region during the Pleistocene. Fossil evidence of upland sandpipers, dating to the late Pleistocene, were found in Kingston Saltpeter Cave, Bartow County, Georgia and in Bell Cave in Northern Alabama. This geographical area was mostly forested then, but extensive grasslands must have also existed because upland sandpipers favor nearly treeless habitats. Both the above mentioned fossil sites yielded remains of the woodcock (Scolopax minor) as well, another terrestrial member of the Scolopacidae. This bird uses its unusually long bill to probe moist earth for worms and grubs. They are year round residents in the south, but much of the population migrates north for the summer. Woodcock. In Ohio they are arriving a month earlier in spring than they did 100 years ago due to global warming. Woodcocks spend their days hiding in the woods but feed in open areas at night. They favor 2nd growth woods with thickets that are adjacent to agricultural fields where they can hunt for earthworms in the tilled soil. Like upland sandpipers, woodcocks are much less common than they used to be because of hunting and habitat loss. In the Pleistocene south woodcocks likely were abundant because megafauna foraging and sudden climate fluctuations created mixed environments of young and old forests, thickets, and grasslands. Moreover, large predators such as wolves and big cats kept numbers of foxes, raccoons, and possums relatively low, reducing nest predation. The south was a refuge for woodcocks during the height of the Ice Age. Genetic studies suggest the woodcock population expanded rapidly following the retreat of the glaciers as more habitat became available. Male woodcocks display by making a “peent” call before flying in wide spirals above their potential mates. The females lay eggs on the ground and carry their young with them for 18 days until the nestling learns to fly. Then in late summer when they moult, woodcocks can’t fly and must hide in thickets, thus explaining why they need varied habitats. Wilson’s snipe (Gallinago delicata) is another species of terrestrial Scolopacidae. They live and nest in marshes where they hunt for worms, grubs, insects, and some plant matter. They are an erratic fast flyer, making them difficult to shoot, hence the origin of the word, sniper. Wilson’s snipes have a curious pattern of migration. They winter in the southeast as well as in South America and migrate over dry land in the late winter and early spring. But when they migrate south, they travel over the coast. This explains why there are an additional 9 species of snipe endemic to various islands. Storms blew some flocks off course where they found permanent refuge on isolated oceanic islands. Wilson’s snipe–a marsh bird. Their habit of migrating south over the coast has resulted in speciation on isolated islands. Workers constructing the 13th hole of the Crockett Springs Golf Course in 1977 unearthed mastodon bones. Paleontologists took note of the discovery and 17 years later when they learned lots adjacent to the golf course were going to be transmogrified into residential housing, they surveyed a nearby drainage ditch and found another partial mastodon skeleton along with fossils of horse, deer, a canid, muskrat, turkey, painted turtle, and frog. This time they also discovered evidence that attracted archaeologists–10 stone tools, 24 lithic flakes, and part of a bone spear tip embedded in a mastodon bone. The tools included a bifacial knife and hide scrapers made from local Fort Payne chert. Moreover, there were butcher marks on the mastodon backbone, suggesting these ancient Americans removed the proboscidean’s tenderloin. The apparently butchered mastodon bone yielded radiocarbon dates translated to ~14,000 calender years BP. Archaeologists regard this as the pre-Clovis era. Photo of the Nashville Golf and Country Club which was formerly known as the Crockett Springs Golf Course. I couldn’t find a photo of the 13th hole where the mastodon bones were found. I don’t know which hole this is. A 3rd survey of the drainage ditch in 2005 found parts of yet another mastodon, and a few years later in this generous spot they found fragmentary evidence of a large Pleistocene mammal, but it was in such poor condition, it couldn’t be identified. Underneath this, they recovered a Pleistocene-aged deer antler. In 2010 the owners of the new house built next to the drainage ditch gave permission to the archaeologists to dig a deep trench in their backyard. Here, the archaeologists found 1582 fragmented bones of mastodon, deer, turkey, turtle, and frog along with 11 more human made artifacts all located 10 feet below the surface of the yard. Mastodon bones found in trench. Mastodons roaming future golf course. The home owners were nice enough to let archaeologists dig this deep trench in their backyard. I had a trench like this dug in my backyard a few months ago. Unfortunately, they didn’t find any fossils. They were replacing the drainage line for my septic tank. Cost me $5,000. Geologists think the Coates-Hines site was an intermittent pond that existed between 22,000 BP-12,000 BP. A stream periodically became blocked, creating the pond, then on occasion it drained. I propose beavers were the agent that blocked the stream. Every so often, predators would kill all the beavers in this locality, and the dam would fall into disuse and break down. A new population of beavers would recolonize the site, and the cycle would begin anew. About 12,000 years ago, rain washed soil down the adjacent hillside and buried the old pond site and stream with colluvial sediment. The ancient beaver pond provided an ideal location for a Paleo-Indian base camp. The ancient Americans opportunistically ambushed big game that browsed aquatic plants, but they also had easy access to muskrats, turtles, fish, frogs, and edible plants such as cattails. All the species of fossil animals found at this site are notably edible. Marshall Forest is located on a southern extension of the Armuchee Ridge within the city limits of Rome, Georgia. At least 100 acres of this Nature Conservancy Reserve have never been logged, making this an incredibly rare site because most of the south was clear cut between 1865-1945. It’s not a large preserve; the protected area is less than a square mile, and it’s bordered by suburban development and bisected by the busy Horseleg Creek Road. The forest is dominated by white oak, post oak, chestnut oak, black oak, tulip, mockernut hickory, black cherry, loblolly pine, and shortleaf pine. Shrubs include dogwood, hawthorne, maple leaf viburnum, black cohosh, and several invasive species. Because much of this site has never been logged or plowed, rare shrubs such as mock orange (Philadelphus) still grow on the virgin soil. 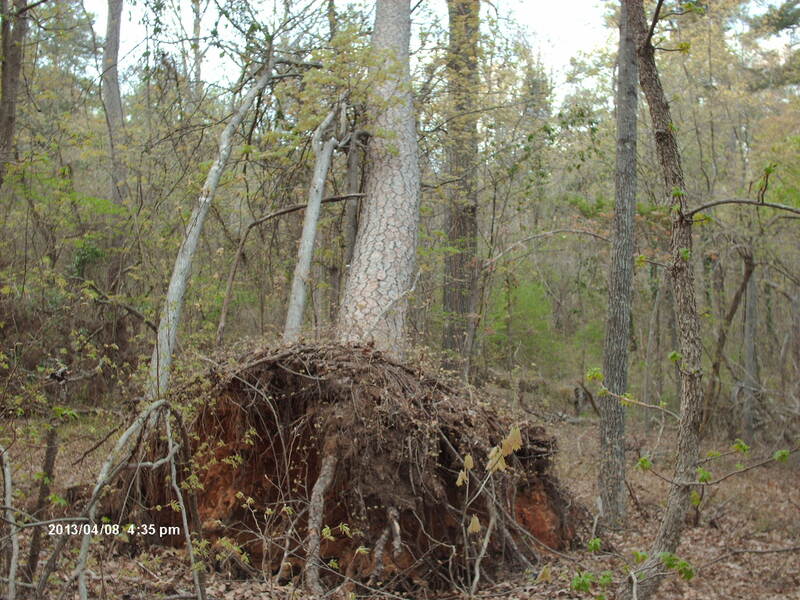 Recent heavy rains followed by heavy winds knocked over lots of trees in Georgia including this pine being held up by an oak in Marshall Forest. The largest trees in Marshall Forest that I saw were about this big. This shortleaf pine was 100 inches in circumference. Marshall Forest is surprisingly open. The late Louise Lipps studied this site some 40 years ago. 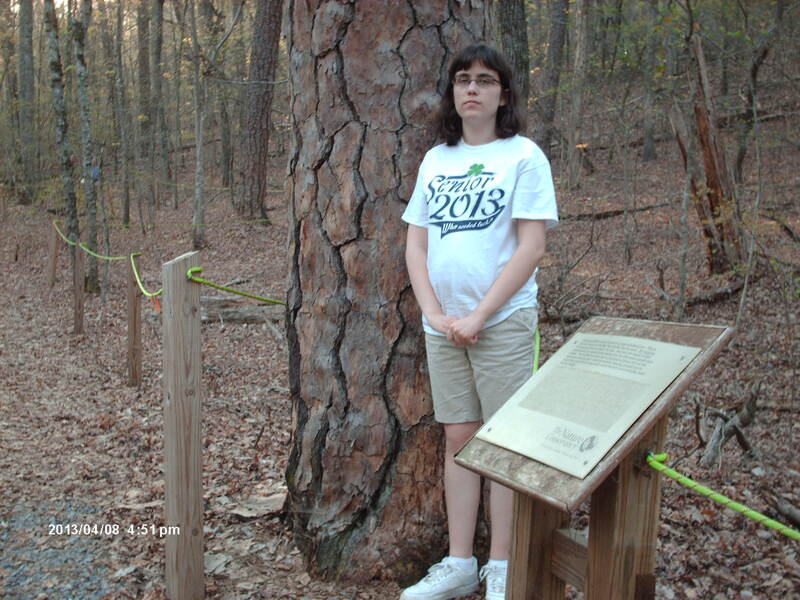 She determined the open nature of Marshall Forest resulted from a 30 year periodicity of ice storms. The age of the pine trees corresponded with 30 year cycles of ice storms that destroyed forest canopy, allowing pines to grow in newly created openings. If not for the storms, hardwood trees would eventually shade out pines. Instead, pines are quite common here. I think windstorms also explain the openness. In my opinion it looked like wind knocked over many of the trees because their root systems were unstable on the soggy ground after all the recent rain. With all the fallen dead wood, woodpeckers enjoy a bounty of insects in the rotting timber. A nearby telephone pole has been nearly shredded by woodpeckers. 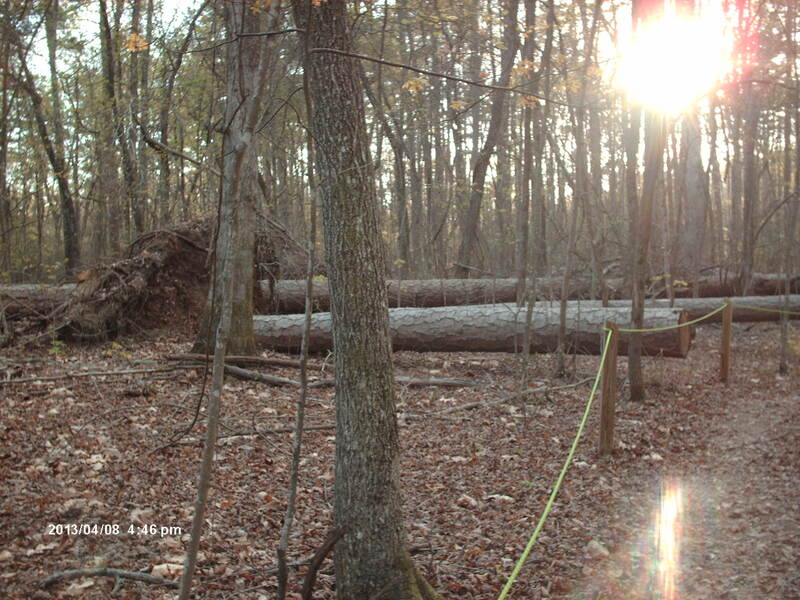 The Nature Conservancy had to saw a path through fallen trees following a recent storm. I counted about 80 rings. These must not be the 250 year old pines that are reportedly still growing here. 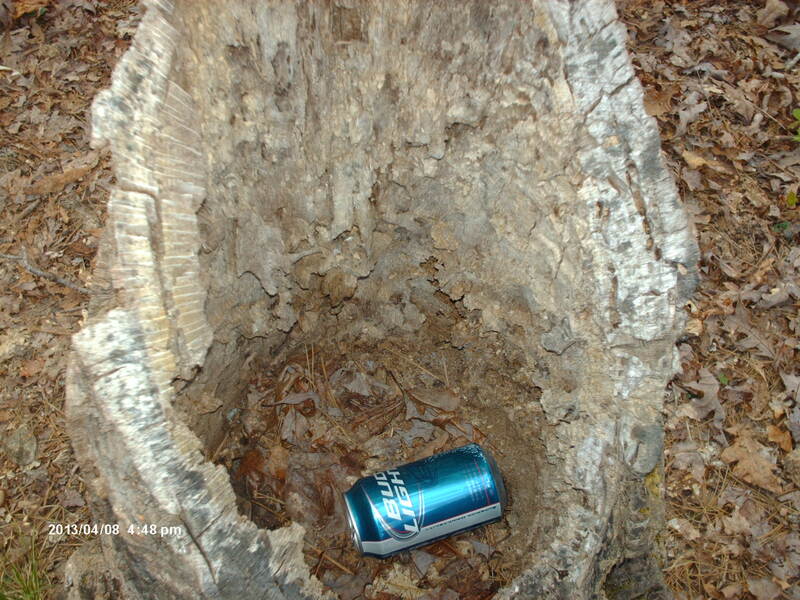 Some slob left a beer can in a tree snag. Why does anybody drink light beer? Might as well drink water. Marshall Forest is surprisingly open. 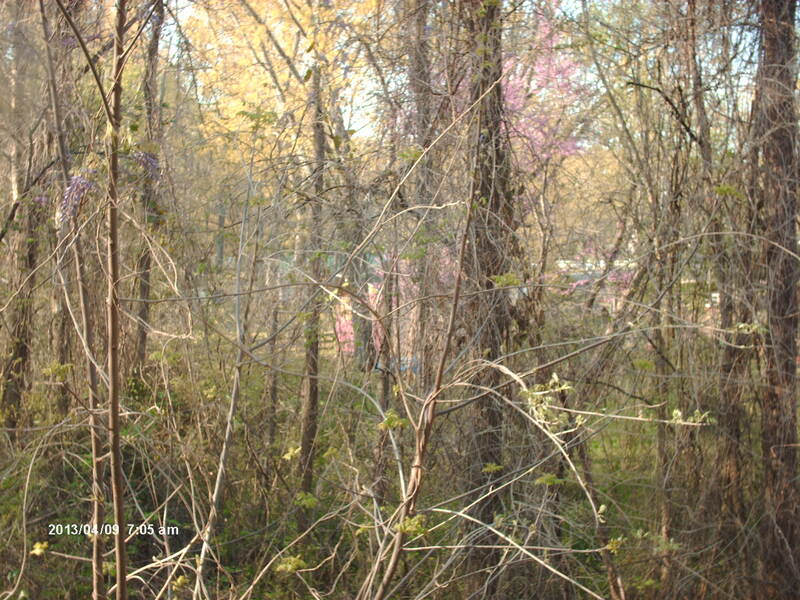 Mature forests are not at all dense, like most of the second growth that covers the state today. Up until the 19th century old growth forests provided plenty of grazing for bison and horses in little patches such as this. I found some large trees, but not as many as one might expect in a virgin forest. The slope of the land and thin soil may prevent exceptionally large trees from growing here. I did measure a shortleaf pine that was 31.5 inches in diameter, and a post oak that was 30 inches in diameter. Supposedly, some of the pine trees in this forest are 250 years old. I was surprised that I didn’t see any squirrels or squirrel nests in Marshall Forest. Maybe early evening was the wrong time of day to see them. 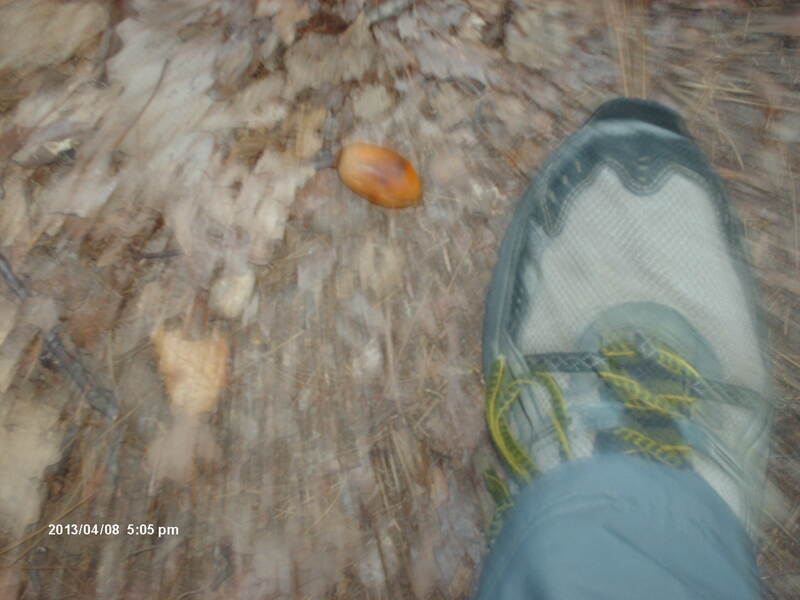 There were large chestnut oak acorns scattered all over the forest floor. Some of them were as big as pecans. The only notable songbird to cross my path was a white breasted nuthatch. A flock of 6-8 turkeys roamed an old pecan orchard across the street from the forest, and the tom was displaying to the hens. 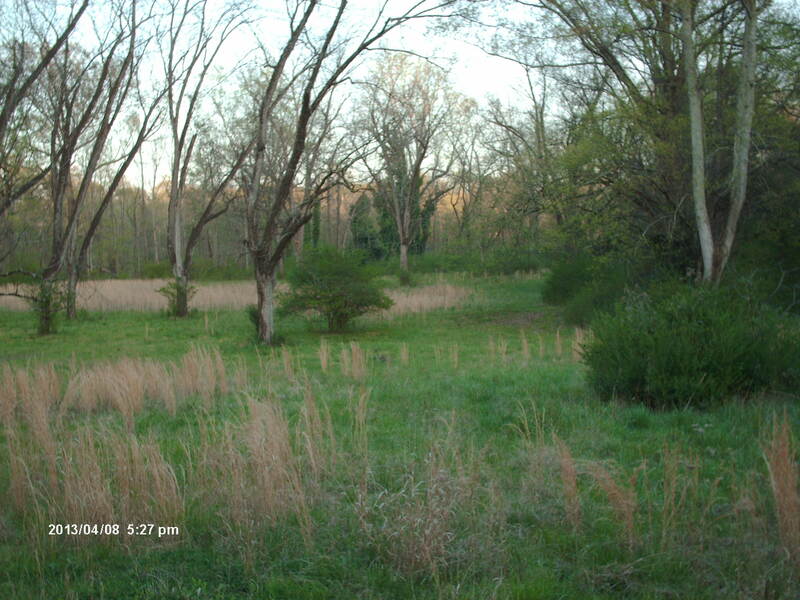 This piece of land is protected by the Nature Conservancy as well, and it stretches to the Coosa River. Chestnut oak is a dominant tree throughout Marshall Forest. Some of the acorns were as big as pecans. I couldn’t figure what this structure on the trail was. 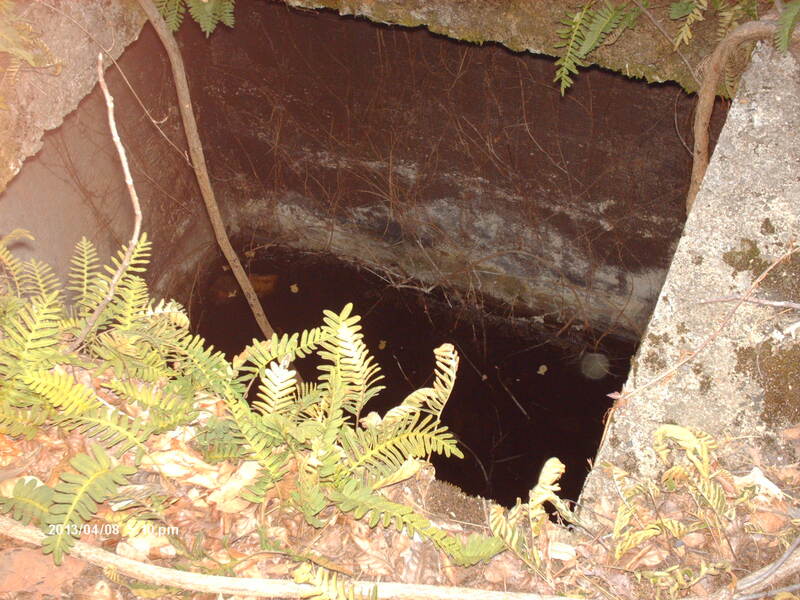 An old well? Cistern? A tom turkey was displaying to half a dozen hens here , but when I approached to take a photo they wandered behind tall grass. 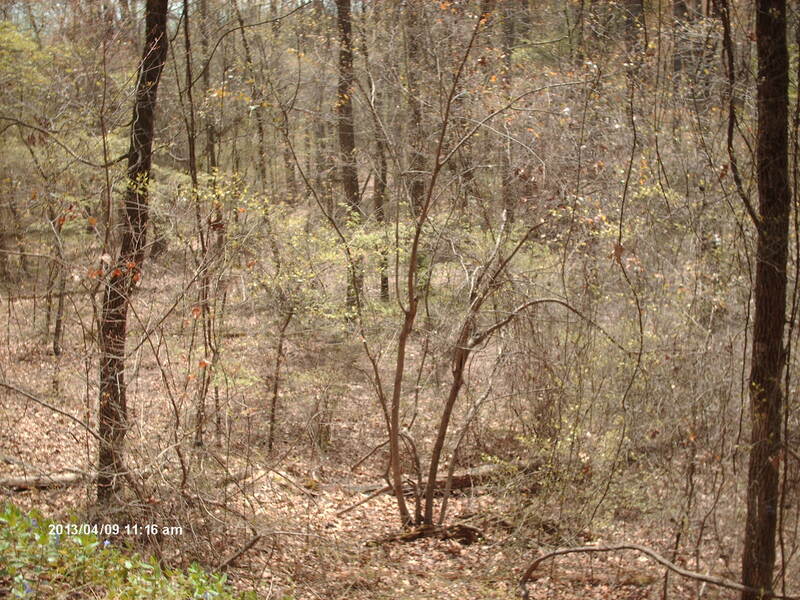 This stretch of land is protected by the Nature Conservancy as well and reaches all the way to the Coosa River. I took a wrong turn before I got to the preserve and accidentally discovered a rare stand of 30 foot tall giant bamboo cane growing on a high bluff adjacent to the Coosa River. 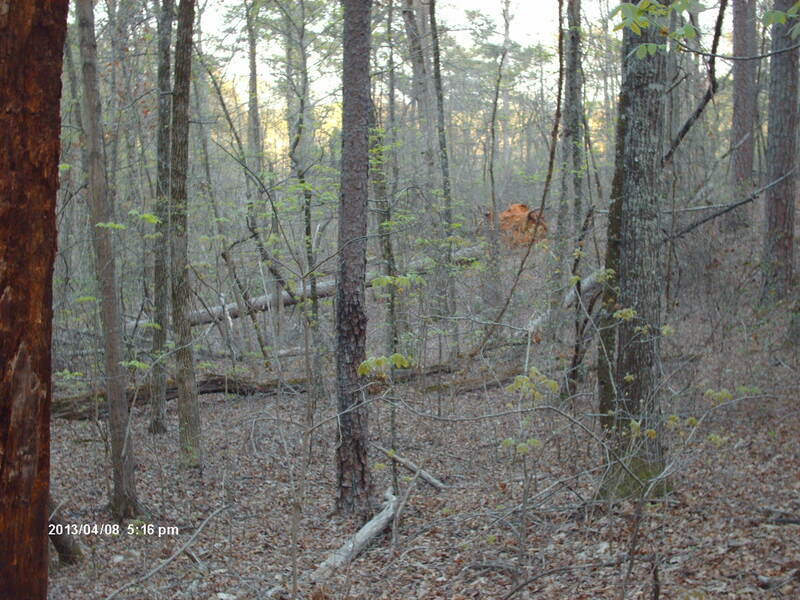 (See https://markgelbart.wordpress.com/2013/01/28/canebrakes-are-forlorn-landscapes/ ) I spotted a red fox darting into the canebrake. I wasn’t able to stop and take a photo of the bamboo though. In this tiny woodlot behind the Comfort Inn where we were staying in Rome, I saw 5 gray squirrels, cardinals, mockingbirds, a tufted titmouse, chipping sparrows, and a Carolina wren in 5 minutes. Suburbs with little woodlots are better wildlife habitat that pine tree farms, that’s for sure. Lavender Mountain is located behind Berry College in Rome, Georgia. It’s open to the public. A northern disjunct population of longleaf pine grows on this unique site. Longleaf pine (Pinus palustris) was a dominant tree on the coastal plain of southeastern North America until the 19th century when this ecosystem was pretty much destroyed. However, it was rare on the piedmont and in the mountains. Because it has long needles, it’s more vulnerable to ice storms and not as well adapted to cooler winters as shortleaf pine. It requires frequent fire for regeneration. 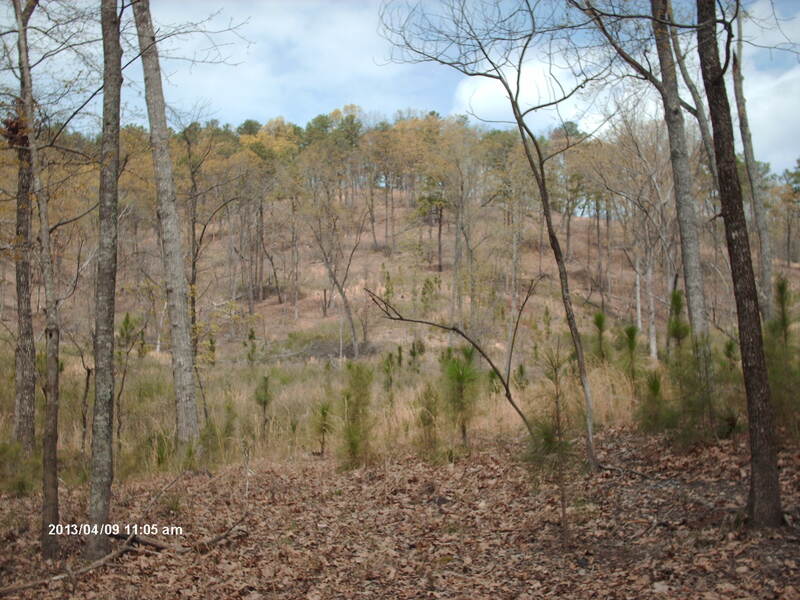 Nevertheless, on some ridges with thin soils longleaf pine does occur as far north as Rome, Georgia. Fire must have been common here for thousands of years to enable longleaf pine to exist on Lavender Mountain. 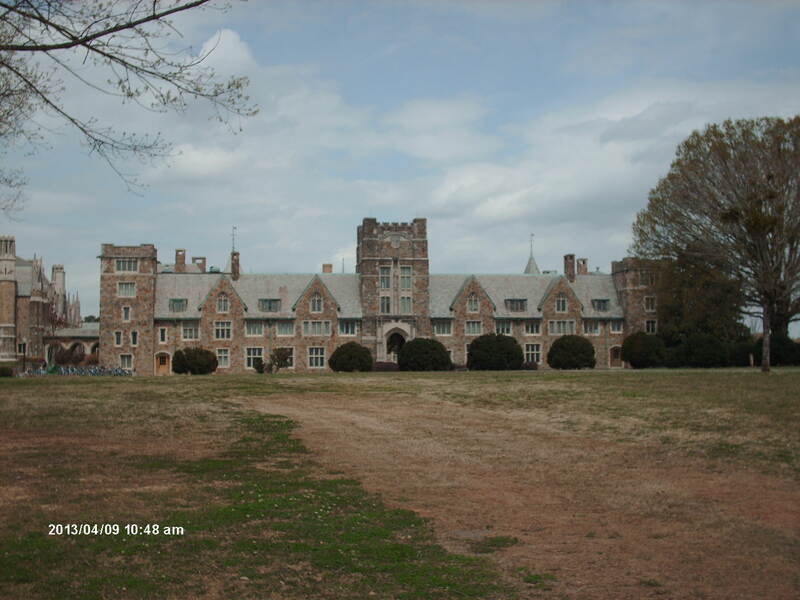 Berry College protected the mountain from logging, but fire suppression and beetle infestation has taken a heavy toll, and oaks began to predominate as they do throughout most of the rest of the region. Now, scientists are trying to re-establish longleaf pine savannahs on the mountain. Berry College campus in Rome, Georgia. This chapel looks like a medieval castle. A huge cow pasture fronts the college. Lavender Mountain Road behind Berry College leads to Lavender Mountain. I can easily imagine mammoths, horses, bison, and elk grazing in an environment like this during the Pleistocene. Longleaf pine seedling. This is the first longleaf pine tree I’ve ever identified. 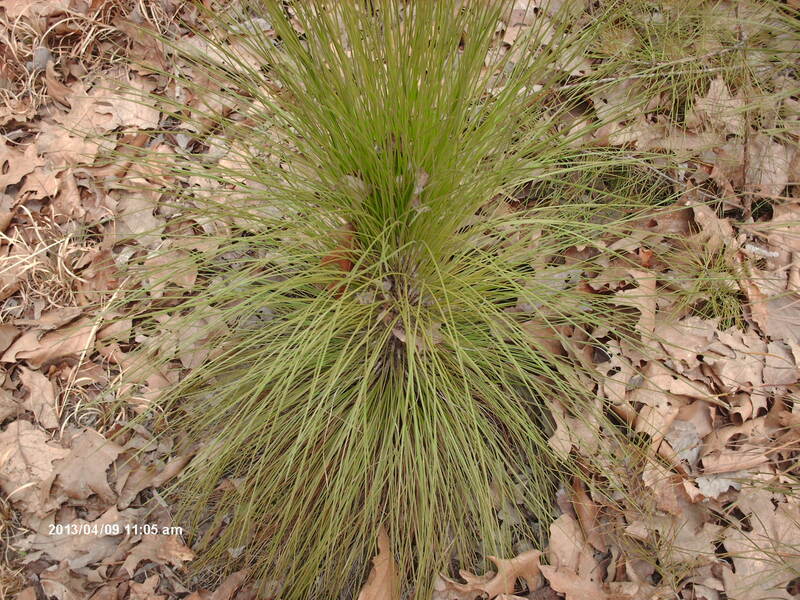 Shortleaf pine has needles 3-6 inches long. 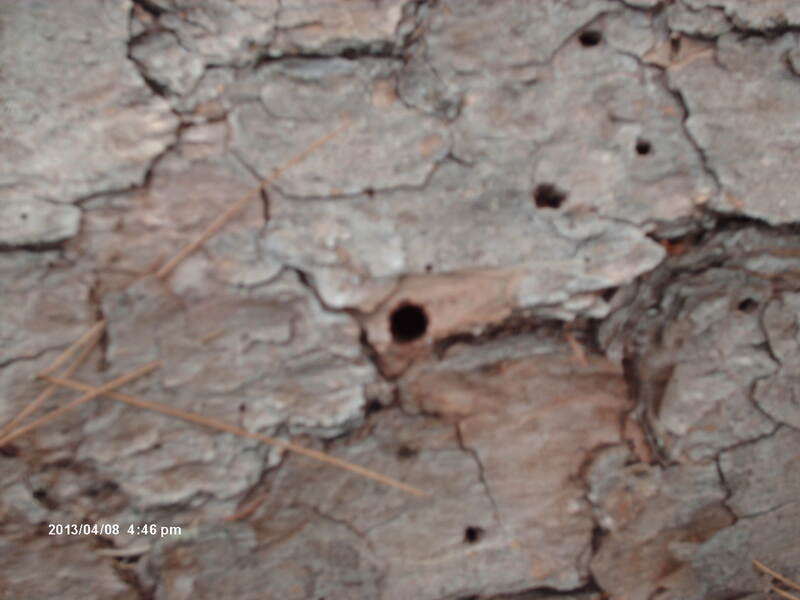 Loblolly pine has needles 6-9 inches long. Longleaf pine has needles 9-18 inches long. These needles were longer than 9 inches. Longleaf pine seedlings can survive fire whereas the other 2 species of southern pine can survive fire as adults but not as seedlings. Same goes for most species of oak. Without fire longleaf pines will eventually disappear from an environment. Scientists are trying to re-establish longleaf pine as a dominant species on Lavender Mountain. 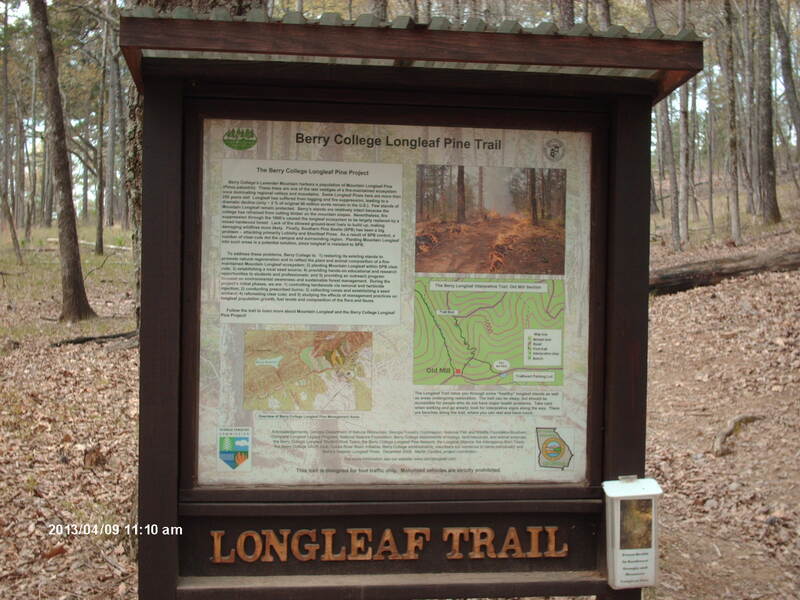 Berry College always protected the area from logging, but fire suppression and pine bark beetle infestation has allowed oaks to outcompete longleaf pines. 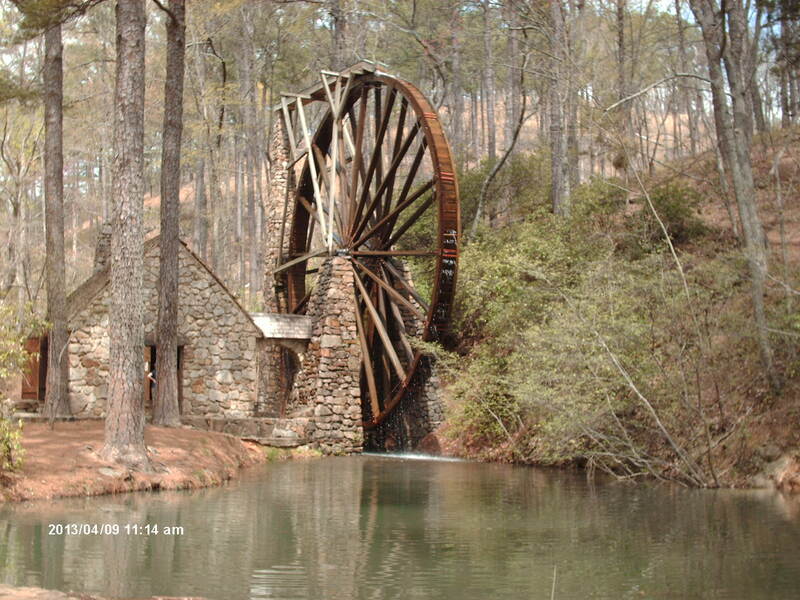 Berry College used to grind their own corn for the cornbread they fed to their students. I walked on the last half mile of Lavender Mountain Road, but I didn’t have time to hike the trails. The mountain is on the right side of the road; a creek bottomland forest is on the left side of the road. Post oak, white oak, black cherry, mockernut hickory, shagbark hickory, loblolly pine, shortleaf pine, and longleaf pine can all be found growing here. 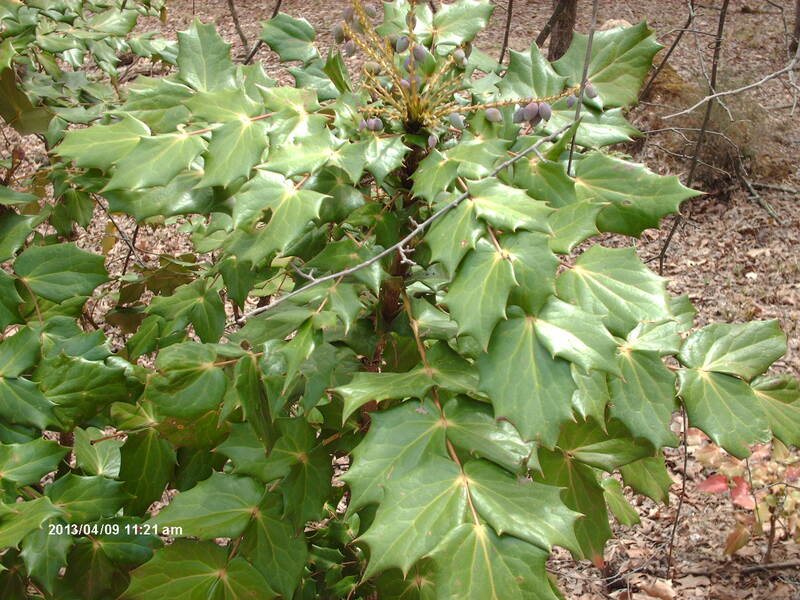 Curiously, oregon grape holly is a common shrub. Birds have spread this ornamental plant to the mountain. I heard lots of birds here, but the only call I recognized was from a pileated woodpecker. I saw deer prints. Herds of deer roam the campus at night and early in the morning. It was worth the visit. Lavender Mountain is on 1 side of the road. This creek bottomland is on the other side of the road. Oregon grape holly is a common shrub in the bottomland. It’s not native. Birds have spread the seed from ornamental plantings. The skunk’s black and white markings warn predators, even those lacking color vision, to beware of the noxious spray this animal is capable of unleashing. The skunk’s defense mechanism is so effective they seem to fear no other animal. When threatened they often run toward much larger animals and chase them away. Nevertheless, skunks do suffer predation. Most notably, great horned owls (Bubo virginianus) specialize in taking skunks, and the owls seem to be immune to the spray. For this reason some great horned owls smell like skunk. Cougars stalk and kill skunks before the skunk has time to respond. Formerly, some Native Americans preferred skunk to other types of meat such as turkey. Scientists no longer consider skunks to be members of the weasel family, the mustelidae. Instead, skunks and old world stink badgers belong to a family all their own known as the mephitidae. 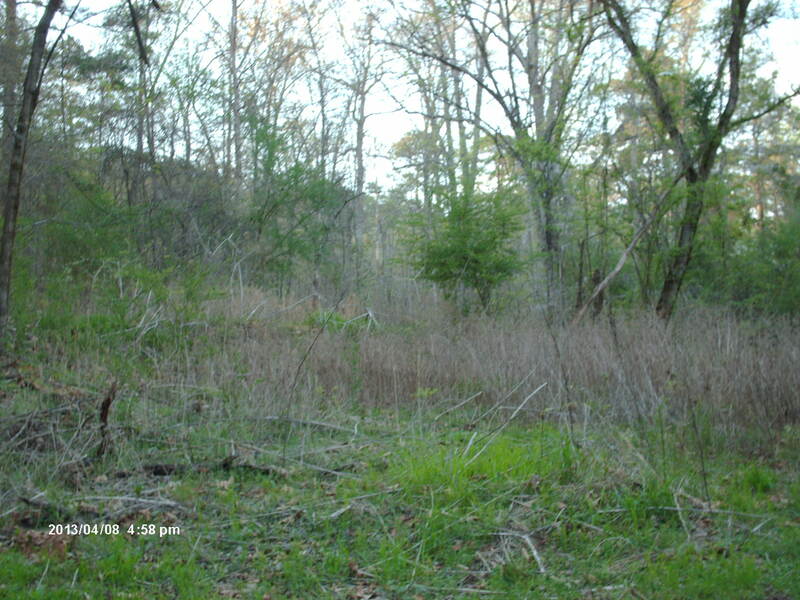 Today, Georgia is h0me to 2 species of skunks–the striped (Mephitis mephitis) and the spotted (Spilogale putorious). During the Pleistocene hog-nosed skunks (Conepatus leuconotus) lived throughout the south as well, leaving fossils at Ladds Mountain, Bartow County, Georgia and several sites in Florida. The extinct short-faced skunk (Brachyprotoma obtusata) may have extended its range into the upper south but was more of a boreal species. Fossils of this species have been found as far south as Arkansas. Striped skunk–the most common species found in Georgia today and probably during the Pleistocene. Striped skunks are the most common skunk in Georgia today, and are the only species found in more than 1 fossil site in state, so they likely were the most common species throughout the Pleistocene. Striped skunks are omnivorous, feeding on small mammals, reptiles, birds, insects, and fruit. I’ve never seen a live individual, but I have frequently seen road-killed skunks in rural areas of north Georgia. They prefer broken country with a mix of fields and woods. Curiously, they’re rare near Augusta, Georgia, perhaps because there aren’t many farms with stores of grain that attract enough mice to entice skunks. Spotted skunk. When a spotted skunk displays a handstand flee the scene immediately…it’s about to spray. I did see a live spotted skunk once in 1990, while I was throwing a paper route at about 5:00 am on Sand Bar Ferry Road located east of downtown Augusta. Spotted skunks are attractive little animals that climb trees–an unusual behavior for a skunk. Spotted skunks prefer forest edge and prairie habitats and are common in the middle part of North America but less abundant on the edges. Hog-nosed skunk. Note the claws for digging up grubs. Current range of hog-nosed skunk and closely related South American species. During the Ice Age its range expanded into the southeast of North America because there was more brushy arid habitat then. Hog-nosed skunks prefer arid brush and grassland habitats, thus explaining why they occupied the south during the Ice Age but no longer occur here. 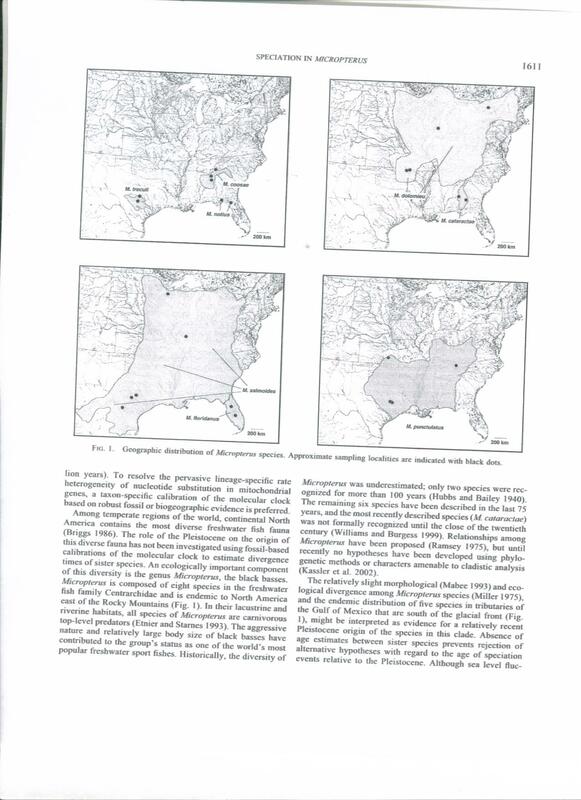 Arid scrub habitat expanded across the southeast during the Ice Age because the climate was drier then. Like striped and spotted skunks, hog-nosed skunks are omnivorous but rely more on insects for a greater part of their diet than other skunk species. Little is known about the extinct short-faced skunk. It was a small skunk, more like the spotted skunk than any other extant species. Based on its fossil distribution, it was an animal of the boreal forests that predominated south of the ice sheet. It co-existed with the other 3 species of skunks, but unlike them, it failed to adapt to the environmental changes that occurred ~8,000 years BP. Perhaps, they were more vulnerable to diseases carried by an increased population of parasites in the warming climate. You are currently browsing the GeorgiaBeforePeople blog archives for April, 2013.